Start off your visit on the 15th (Wed): admire the natural beauty at Humayun's Tomb and then take in nature's colorful creations at Akshardham. Here are some ideas for day two: see the interesting displays at National Museum, hunt for treasures at Chandni Chowk, and then look for gifts at People Tree. 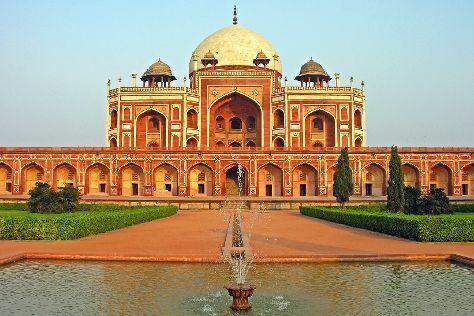 For maps, photos, other places to visit, and tourist information, read New Delhi trip maker website . The Route module shows you all the different ways you can get to New Delhi. Expect a daytime high around 47°C in May, and nighttime lows around 30°C. Finish your sightseeing early on the 16th (Thu) so you can drive to Agra. Get some cultural insight at Agra Fort and Taj Mahal. Shop till you drop at Marble Handicrafts Agra and Shahin Arts. There's still lots to do: take in the exciting artwork at New Nice Marble Art & Handicrafts, browse the exhibits of U.P Handicrafts Development Center, and relax and rejuvenate at some of the best spas. To see where to stay, photos, ratings, and tourist information, read our Agra online day trip planner . Traveling by car from New Delhi to Agra takes 3 hours. Alternatively, you can take a train; or take a bus. In May, plan for daily highs up to 48°C, and evening lows to 30°C. Cap off your sightseeing on the 19th (Sun) early enough to travel to Leh. Start off your visit on the 20th (Mon): stop by Pashmina House, contemplate in the serene atmosphere at Chokhang Vihara Temple, and then hit the best photo ops around with an inspiring photography tour. Here are some ideas for day two: take in the exciting artwork at The Little Paradise, identify plant and animal life at Donkey Sanctuary, and then contemplate in the serene atmosphere at Thiksey Monastery. To find traveler tips, maps, more things to do, and other tourist information, read Leh trip planner . Traveling by combination of train and flight from Agra to Leh takes 5 hours. Alternatively, you can drive; or do a combination of train, taxi, and bus. Finish your sightseeing early on the 21st (Tue) to allow enough time to travel back home.